Hello Friends. . Since getting back from Holidays in February, time has been on hyper-speed. But that is just how things go sometimes. While I was away I was able to do some extra reading and research. 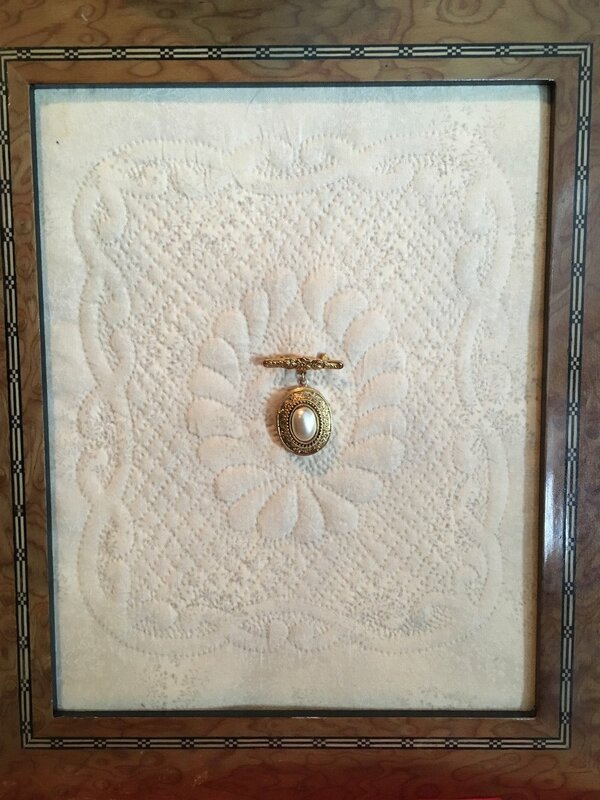 I stumbled upon a decorating article that tied into quilting. My internet exploring lead me to the “Colour of the Year”. Brakes on! Colour of the year! Is this something that I should make note of? As quilters, we often get stuck in colour ruts. Much like piecing where the layout is familiar and comfortable or the piecing does not require a learning curve. Most quilters have a favourite colour that speaks to them. It is a colour that they gravitate to when choosing colours for a new quilt. It is important to explore new colour ways. Just like new designs and layouts, it opens the creative mind to the possibilities of a new palate. “But where do I start”? This is a question I am asked a lot. This fear occurs because many quilters do not feel confident when choosing colours. I can see you nodding your head now as you read this. As you go through your day, lets say walking through the grocery store or perhaps the mall, observe the colours around you. The mixtures of lemons and oranges next to the apples and bananas. Or perhaps a rack of new spring t-shirts on display in front of a store. Colour combinations that speak to you and make you say, “I would of never thought of that”. You can start to take pictures with those fancy phones we all seem to have so that you can refer to them later. I like to take pictures of flowers in the summer. I put them as a slide show on my screen saver as a kind of catalyst for new inspiration, especially in the winter when our landscape is a mixture of whites, greys and black. It is hard to think of new colour combinations when we have a stash to use in a colour way that is tried and true. But limiting ourselves does not allow for growth and adventure. It’s always fun to see where a little push may bring us. 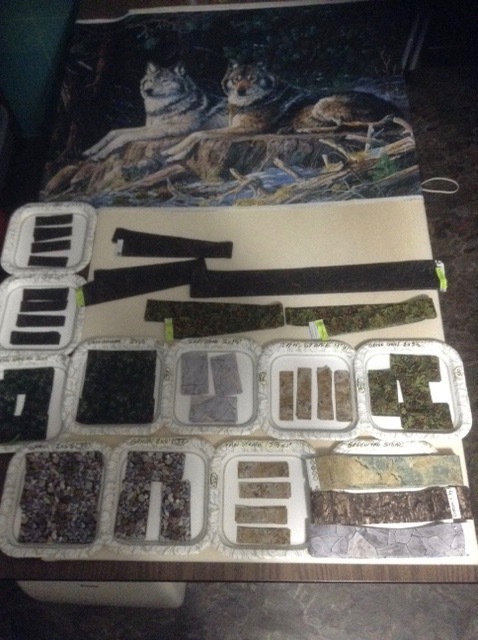 Speaking of new layouts and colour ways, I would like to share a few photos of completed quilts from the Storm at Sea workshop that took place in early November. 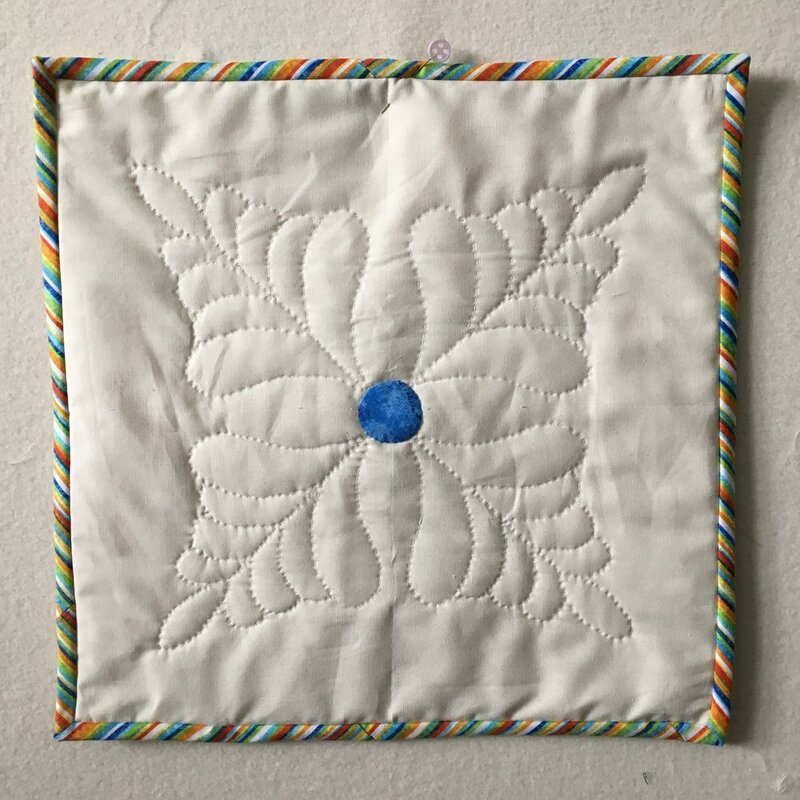 Thank you so much for sending along photos of your quilts. Thanks for dropping by. Until next time, stay safe, quilt with a new colour, and watch the snow melt. It's a perfect time for quilting! Hello Friends. Believe it or not this is my favourite time of the year. Its cold and snowy outside. With snow shoveling the exception, outside chores are at a minimum. Inside the house, everything is low key, that quiet and uneventful time after Christmas. All this adds up to the perfect setting for some real quilting time. Snow days equal Sew days and here in Northern Ontario, January to March quilters buckle down and quilt up a storm. How do I know this? Well the quilters that frequent the studio are in prime quilting form with lots of new quilts started and some old ones being finished. I myself have been working on some new samples for upcoming classes this spring. First is Tumbling Triangles made with the V-Block tool by Studio 180. I will be teaching "Tumbling Triangles at Cindy Bee's Quilt Shoppe in Espanola, Saturday March 18th 10am to 4pm. This has also been added to my "In Studio Sessions" list so give me a shout and we can arrange a time to come to the studio to make this fast, fun and easy project. It is easy and fun to put together, and whips up in no time. On the design wall is another fast and fun quilt “Love Links”. Believe it or not, it is all constructed from flying geese, and the pattern makes several sizes. It is also that time of year when we northerners go seeking some warmth and sunshine. If your anything like me, travel time is a great time for those little handwork projects that we somehow never have the time to do at home. I like to do hand work on a plane or driving in a car. I am so thankful that I do not get motion sickness. I have a difficult time sitting idly for long periods of time. One of my take along projects is my ongoing work in hexies. My hexies are ¾” in size and are so adorable. It is definitely a work in progress, as I started these last February, but Hey, what’s a quilter without UFO’s? These little guys at 3/4" are so cute! 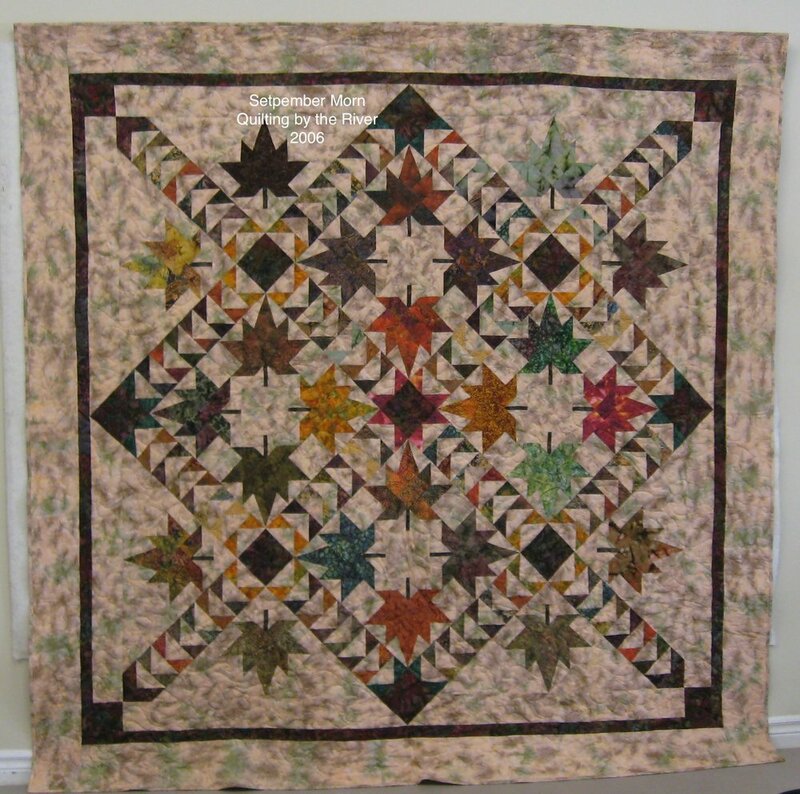 I am looking forward to Kathy Wylie’s visit here in May to soak up her tips and tricks when making hexies. 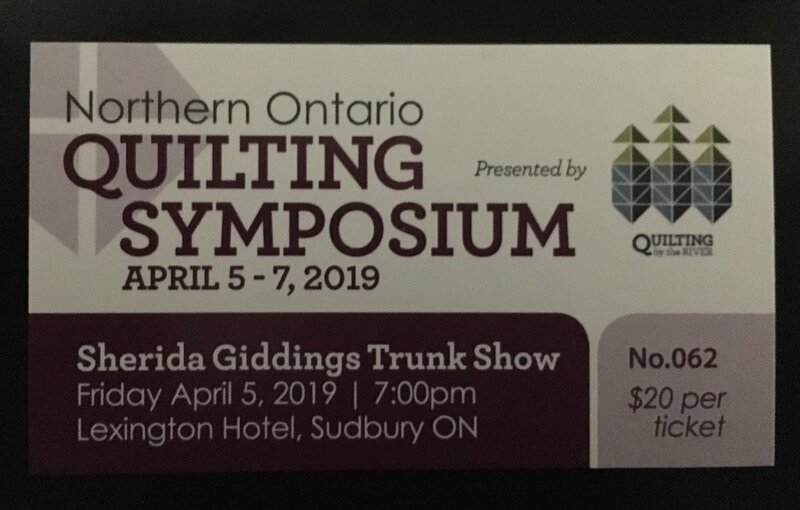 (Kathy will be here in Northern Ontario for workshops.) Click here to find out more. I find wool felt projects so relaxing to stitch out. Once the pieces are in place, it is just a blanket stitch to hold the pieces down and its good to go! So when your walking on the beach, have a look around, maybe you will spot me stitching in the shade. Thanks for dropping by. Until next time, stay safe, keep warm and go finish a UFO!